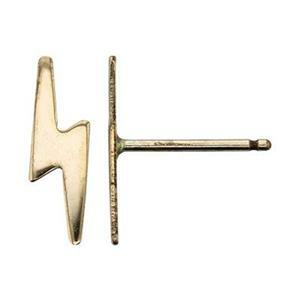 14/20 Gold-Filled 3.5x11.3mm 24 gauge Tiny Lightning Stud Earrings Post, .7mm Post Thickness. Clutches not included. 10 piece pack is the equivalent of 5 pairs. They say Lightning Never Strikes Twice in the Same Place. Not necessarily! Our GF203R – 14/20 Yellow Gold-Filled 24 Gauge Tiny Lighting Stud Earring Posts. Please choose from our Gold-Filled Clutches to affix to your Posts. And to see Lightnight Strike Twice – insert one of the posts into our Gold-Filled Tiny Lightning Charms.